Police received a tip that next to the home of Ray Foss in Bellflower, several people had been observed burying something that may have been the body of an infant. Thankfully, no bodies would be found. Police had discovered however, that Ray had an outstanding felony warrant from 1925 for operating a "baby farm" in Moneta (near Gardena). The fear of being nailed on the baby farm charge loosened his tongue, and Ray Foss began to relate a sordid tale of baby trafficking, illegal adoption, an alimony racket, bigamy, and narcotics addiction. Ray told the cops that a woman being held in County Jail on forgery charges under the name of Minnie Williams was actually his wife, and that she had been the proprietress of the Moneta baby farm. The baby farm had come to the attention of the authorities in 1925 when Minnie sold a baby girl to a woman who gave her name as Mrs. Johnson. The infant was found to be blind, and Mrs. Johnson returned the child and demanded a refund. The child later died. Mrs. Foss gave the woman $25 in cash, and in lieu of the remaining $35, she gave her another baby! Ray and Minnie fled a short time later to avoid standing trial. During the next two years Minnie trafficked in babies, ran an alimony racket, and fed her drug addiction. She provided infants for women to carry into court when seeking alimony. Prior to being identified as Minnie Foss, sheâ€™d tried a variation of the alimony con in Judge Hardyâ€™s court. Using the Williams alias, she made an emotional plea for probation on the forgery charge, alleging that she was about to become a mother. The court soon discovered that she was not actually Minnie Williams, and that she was wanted in the Moneta baby farm case. With the masquerade over, Mrs. Foss began to confess to Deputy District Attorney Costello. Things got off to a strange start when Minnie was asked to state her name for the record. She told the Deputy DA that her last name was really Hines, not Foss. She said that sheâ€™d married Ray Foss when she was only 15 years old, and then met Clarence Hines in 1921. The three lived together in a mÃ©nage a trois until Foss left. Minnie claimed that she then married Clarence, but never went to the trouble or expense of divorcing Ray. How did Minnie end up trafficking in babies? According to her, she was in fact, a "serial adopter". In 1922 she had noticed a newspaper ad about adopting a baby. She said that she went to the Mexican quarter near the Plaza and met with a couple who told her that they had a child they couldn’t keep. Minnie took the baby home and passed him off to Clarence as his own child. She told him that the child had been born to her while she was away in Burbank! Clarence may have been a very dim bulb, because over the next few years Minnie said that she brought home several other infants including a set of twins, and that she had informed him that he was the father! According to Minnie, Clarence never questioned her about any of the babies, so she continued to adopt. Maybe Clarence wasnâ€™t quite as gullible as Minnie had thought, however. When questioned by police, Clarence told a slightly different story. He said that heâ€™d known that his wife sometimes placed â€œnot wantedâ€ babies. He also told investigators that he was aware of a black trunk which may have been used to store baby clothes or as a coffin for some of the unwanted babies. The trunk was later found at a home near Bakersfield that had once been occupied by Ray Foss. 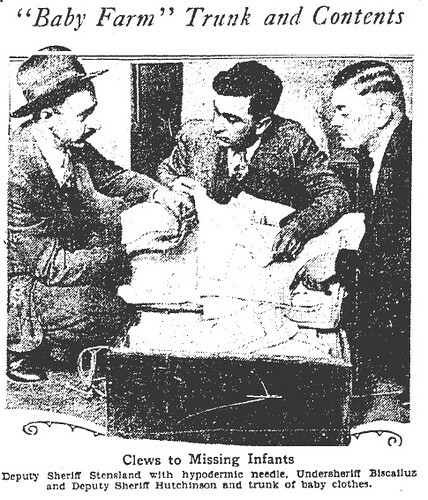 When the trunk was examined by police it was found to contain baby clothes, a hypodermic needle, and a marriage license issued to Ray Foss and Minnie Magnolia Williams. Also found in the trunk were approximately twenty-four photographs of young girls and babies. Even though Minnie said that sheâ€™d adopted the infants, the most likely scenario was that she occasionally kept unwanted babies born to women in her care. Where did all of the babies go? Police traced many of the children to foster parents who subsequently adopted them. Several infants remained unaccounted for. Although there were many unanswered questions â€“ particularly regarding the fates of the infants who could not be found, Deputy DA Costello dropped the baby farm charges because Minnie and Clarence had confessed everything to his satisfaction â€“ including an addiction to narcotics for which Minnie was treated with Narcosan. The DAâ€™s office couldnâ€™t pursue the bigamy charges because the statute of limitations had run out. Minnie pleaded guilty to issuing a fraudulent check and was given a sentence of from one to fourteen years in prison. Clarence received a similar sentence.